What can an eyegaze communication device help me do? With an eyegaze communication device, you can type on a keyboard and phrase page to communicate, as well as check email, surf the internet, and have access to computer functions—all with the movement of your eyes. 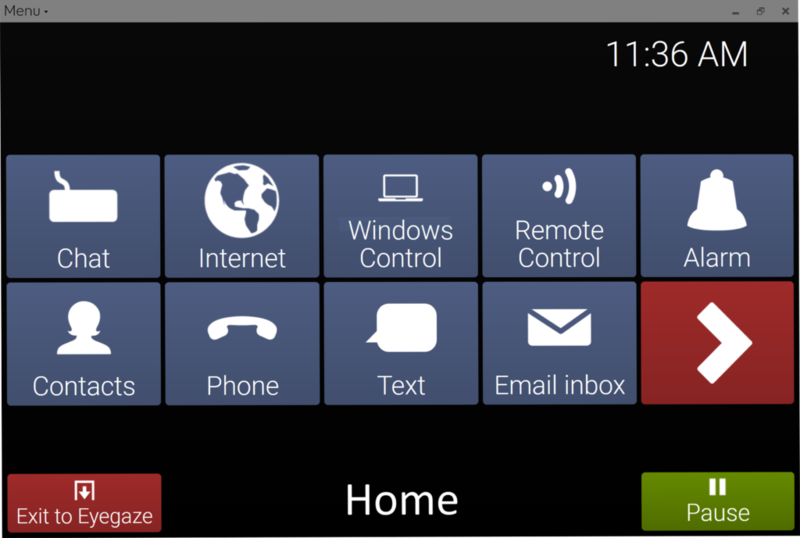 You can sync your smartphone for SMS text messaging and calling, and have options to control your environment. With communication and computer access, you can participate in your care and stay connected to the world around you. What are the steps to getting my own communication device? There are several small steps to take in order to get an eyegaze communication device—don’t worry, we’ll walk you through them and answer any questions along the way! To begin, you’ll need a communication evaluation by a speech-language pathologist (SLP), so visit your doctor or neurologist to get the process started. 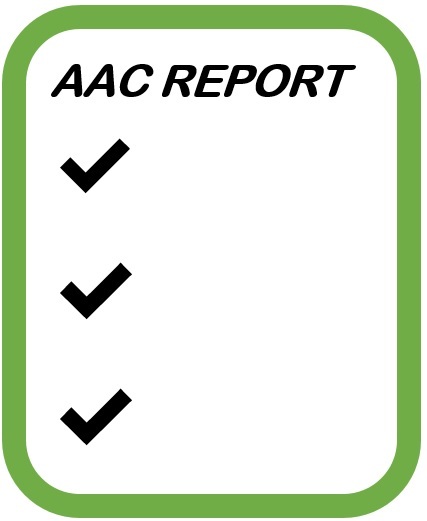 This evaluation is called an AAC assessment. AAC stands for alternative and augmentative communication. In order to have a thorough evaluation you and your SLP will need to research what type of eye gaze devices are available in your area. You will need demonstrations of a few different models to see what works best and to determine your preferences. Medicare and insurance companies also want to see that several devices were tried, leading to a well-researched decision. Your SLP will finish the AAC report and send it to your doctor. Trying out different eyegaze devices: During a demonstration you should know quickly if the device will work with your eyes or not with a certain degree of accuracy. After calibration, try accessing a basic keyboard and phrase page to test how it works for you. If possible, have the company representative show you some more advanced features (like surfing a web page) and then try it yourself. While it will take time to become proficient, you should be able to access simple pages accurately. During the demonstration, don’t be afraid to ask questions! Ultimately, you will want to choose a device that calibrates quickly and accurately your eyes, will allow precise access to communication and computer functions, and will not make you fatigue quickly. Choose a company that has a good reputation and skilled staff to train and support you in the future. Your unique eyes: Make sure your chosen device will work with your eyes, whether you wear glasses, have had lens replacement surgery (cataracts), or have any other eye conditions like ptosis (droopy eyelids) or mydriasis. The written evaluation: Your SLP will evaluate and document your current communication abilities and methods, including what works and doesn’t work for you. They will document what types of communication devices have been tried, from everyday methods like talking and writing, to using tools such as a letter-board for spelling, a tablet or cell phone (for texting), and more advanced communication devices with touch screens or eye tracking devices. With a thorough evaluation, your SLP will recommend which type of device will be best for you. You have input in the process—your experience with eyegaze devices from different companies should be listened to in order to make the final decision. DME Prescription form: Your doctor will read the SLP evaluation and fill out a durable medical equipment (DME) prescription form, ordering a communication device for you. In order to get your device, you’ll need to have had a documented face-to-face visit with your doctor within the last six months. Paperwork: Once an Eyegaze device is recommended for you, you will need to fill out funding paperwork from the company that makes your chosen device. Once the manufacturer of your eyegaze device receives your SLP’s report, your doctor’s DME prescription form and the funding paperwork from you, they will move forward in building your communication device. The company will have a funding coordinator to help answer questions along the way. You will be told how much of the device will be covered by insurance, and how much money you will owe, if any. Delivery and training: The exciting day will arrive and your eyegaze communication will be delivered to your home. The company will send a trained representative to help you set up and learn how to use your new device. Ask questions, involve your family and caregivers, read the training manual and watch training videos to increase your knowledge. To become fluent with your new eyegaze communication device, practice and explore! You will be given contact information for technical support after your initial training for when you need additional help. How to find the right device for you? Do your homework before making a decision. • What was my experience with the company’s representative? • How easy was the device to calibrate to my eye(s)? • How accurate was it? • Was it comfortable to use? Was it fatiguing? • Will it accommodate physiological changes in my eyes over time with my diagnosis? • Will it work with my unique eyes? • Did I like the software and user experience? Will the hardware meet my needs? • Will it allow me to do what I want to do every day? • Who will be supporting me in teaching and technical support after my purchase? • Are there testimonials from people like me using the communication device? In our experience over the last three decades with eyegaze technology, we’ve seen that consumers who do their homework before they decide are much happier, and find a device that works best for them. When you see all available options, you can make the best decision. The Funding manager of the company you choose can walk you through the specific details of your coverage. For people with ALS, Medicare often is the primary funding source. With this in place, 80% of the cost of a speech generating device is covered. For the remaining 20%, some people will have private or secondary insurance available. Some individuals who do not have this may have an out-of-pocket cost. Some families with financial need can apply for help from organizations like Team Gleason or the Brigance Brigade. For people who are on hospice, who live in long-term care facilities, skilled-nursing facilities, or hospitals, Medicare and insurance companies will not cover the cost of a communication device. 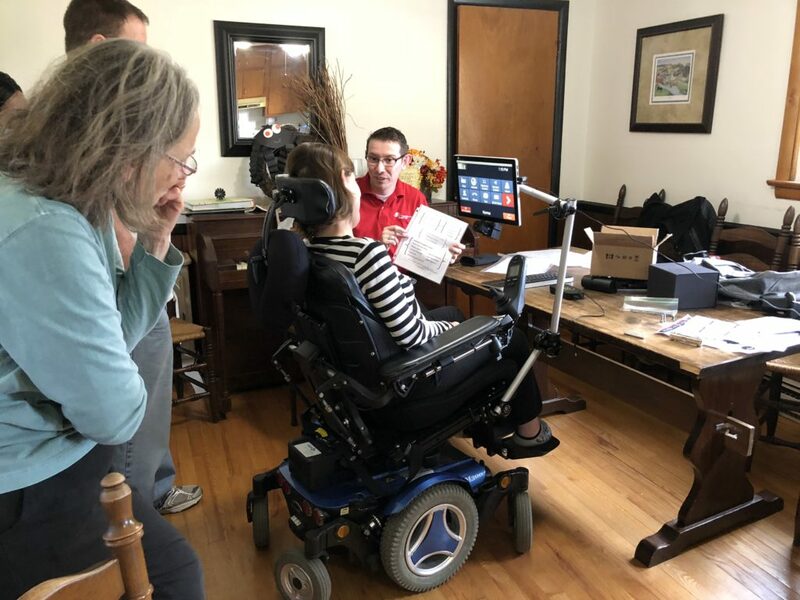 In these cases, some families can either privately pay for a communication device, raise money to purchase one, or rely on local charitable organizations such as the ALS Association loan closet, a state assistive technology lending library or Team Gleason. Will the Veterans’ Administration (VA) get me a communication system? For Veterans who need an eyegaze communication system, you can receive services through your VA Audiology and Speech-language Pathology Clinic. A team of therapists will evaluate your needs and may call in vendors from various eye gaze companies to provide a demonstration. Some VA hospitals may have limited choices in-house, so we encourage you to advocate for yourself and ask to try different systems so you can make an informed choice, rather than simply accepting a communication system that is assigned to everyone, without personal factors considered. Your Communication Bill of Rights states that everyone has the right to choose from meaningful, working alternatives when selecting a communication device. Once a device is chosen, the VA healthcare system covers the cost of communication devices for Veterans. How long does it take to learn and who will teach me? Once your eye gaze communication device arrives, the company will send a representative to teach you how to set up and operate your new machine. Just like learning any new skill—learning how to play a song on the piano, learning a new dance step, or how to perfect your golf swing—it will take instruction, practice, repetition, trial and error, and a dedicated support team. You will be given the initial instructions for basic skills, as well as training materials to advance your skills on your new eye gaze system as you practice. Your caregivers should learn how to set up and operate the device, and you may also have an SLP to practice with you for a short period of time. Allow yourself permission to make mistakes, and practice your skills starting with the basics then moving to more advanced features. Write down your questions as well as challenges, and contact your trained representative and the technical support team. What are important things to know about my eyes and my ALS? You may be seeing a therapy team along your journey to work on physical therapy, occupational therapy, speech-language/swallowing therapy as your body changes. A major theme in these interventions will be that of energy conservation—learning how to get things accomplished with as little energy as possible, and saving your energy for the things that matter most. ALS zaps strength and leaves people too fatigued to do things over the course of the day. While the muscles that control your eye movement are often preserved for a long time, other involved muscles, including the muscles that lift your eyelids and head, can become fatigued. Some people have droopy eyelids that may partially block their pupils, which can be a big problem for some eye tracking devices. 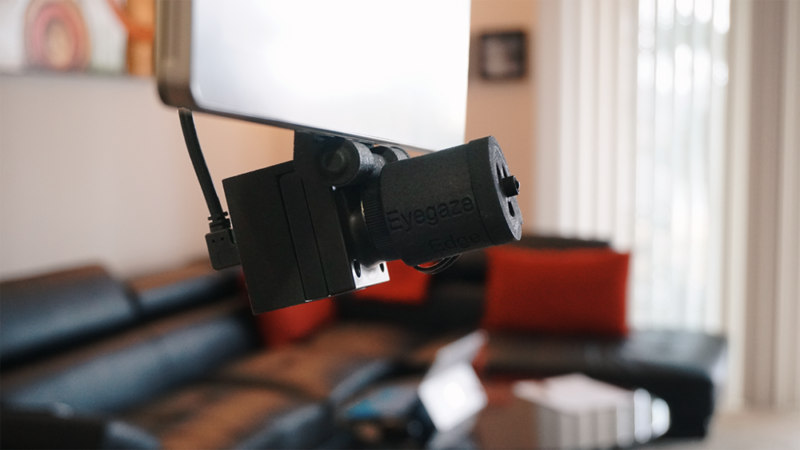 We recommend that people with ALS try eye gaze communication systems that accommodate for ptosis of the eye lids (droopy eyelids) and have camera hardware and software communication screens optimized to lessen fatigue for use throughout the whole day. We also recommend that they try a camera with fewer infrared lights, to avoid unnecessarily drying out their eyes too quickly throughout the day. 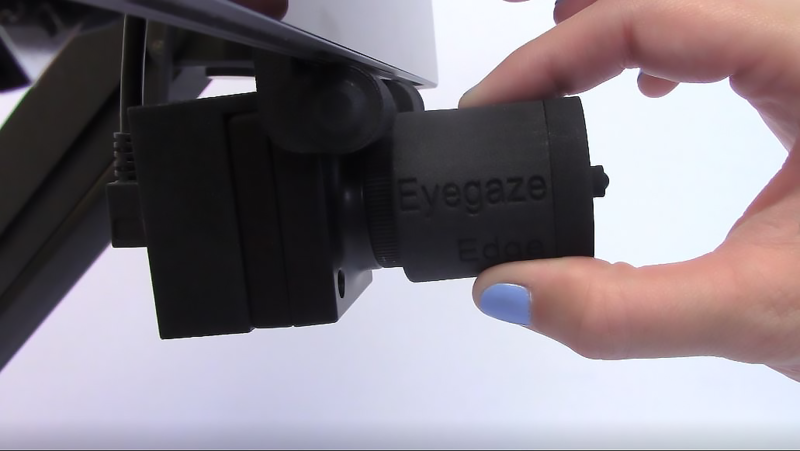 To learn about how the Eyegaze Edge accomplishes these important factors, click here: Eyegaze Edge Unique features for ALS users. PALS across the globe use the Eyegaze Edge® to communicate, write books, continue working, and stay connected to their world. Exercise your communication rights by asking for meaningful alternatives during your AAC evaluation. If you have questions for our team of eyegaze experts, give us a call at 1-800-EYEGAZE. James M. Brinton, M.A., CCC-SLP, LC Technologies, Inc.